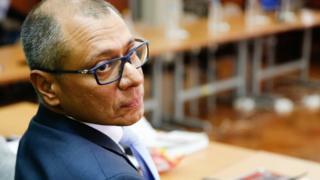 The vice-president of Ecuador has been sentenced to six years in jail in connection with corruption at the Brazilian construction giant Odebrecht. Jorge Glas is the highest-ranking politician to be convicted in the scandal that has spread across Latin America and further afield. Prosecutors said he took $13.5m (£10.2m) in bribes. The president had removed his duties from him, and he had been in preventative custody since October. The company routinely gave bribes to win business, particularly in government contracts. It has admitted to paying $788m in bribes across 12 countries. Glas was arrested on 2 October. Vice-president since 2013, he was re-elected to the post in February. But with corruption allegations mounting against him, he was relieved of his duties by President Lenín Moreno in August. As part of a plea deal, former top Odebrecht executive in Ecuador Jose Conceicao Santos revealed that the company had paid $33.5m in bribes since 2007 to secure infrastructure contracts in the country. Prosecutors said Glas took payments via his uncle, Ricardo Rivera, who is one of four other people also sentenced to six years. Glas's lawyer said the sentence was "wicked" and "barbaric". Former President Rafael Correa, who appointed him, has previously said he believes the case is politically motivated. The sentences will not take effect until confirmed by the court, and the defendants also have the chance to appeal. The scandal has tainted politicians in several other countries, including Mexico, Peru and Panama as well as Brazil, where Odebrecht is based.